A key question related to the Queen’s Head pub is which Queen is it named after? The current pub sign features two playing cards which gives little indication to the identity of the queen and both Elizabeth and Victoria have lent their faces in the past but documents suggest neither are correct. A property is marked on Francis Allen's map made in 1630 (right) which appears to be on the site of the Queen's present property but there is no reference as to its use. The current building has been dated to early 1700s with extension in late 1700s  and an old cellar door from the pub, no longer in use, has a date of 1709 still visible. But when did the building become a pub? The Victualler’s Recognizances for 1747 which lists hundreds of pubs in Chippenham and Calne, mentions several in Box but not the Queen’s Head. 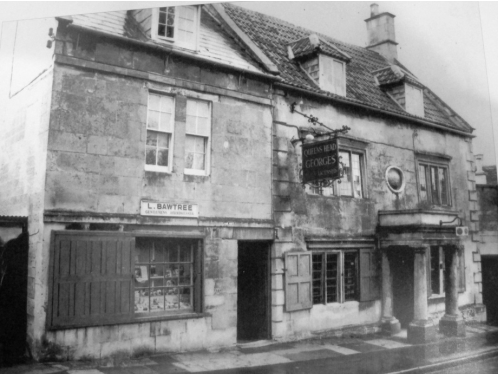 However a newspaper article from the Bath Chronicle in 1795 describes the Queen’s Head as a capital publick-house.... many years (nearly half a century) in occupation of MRS LEE. This suggests that Mr and Mrs Lee were the first owners of the Queen’s Head, perhaps converting their home into a coaching inn in order to service the increased traffic that flowed through the village when the new London to Bristol road was opened in 1761. Ideally positioned in the centre of the village, it became well known as a comfortable resting point. The same newspaper article comments that the pub was remarkable for its cleanliness and comfortable accommodation ... the well-known respectability the Inn was held in during Mrs Lee’s residence, needs no further recommendation. So, could the pub be named after George III’s wife, Charlotte, who became Queen when she married George III in 1761, the year the London road was opened? If so, it was probably rebuilt as a coaching inn to service passengers and horses travelling on the new London to Bath Road. The property had a wide road frontage (now the entrance to the car park) and offered almost enough space for coaches to pull in. A fascinating reminder of this is the grooves on the wall at the rear of the pub caused by vehicles scraping as they turned round (below left). The stables still exist opposite the pub, and after a stint as public lavatories they are currently being converted to housing. Over the 250 years the pub has served the people of Box and there have been numerous owners and licensees (see below for full list). A number are certainly worth a mention here! In addition to Mrs Lee there are widows who, on the death of their husbands, decided to continue to run the pub in their own name for a considerable number of years. Mrs Elizabeth Mitchell bought the pub with her husband William in 1798 but ran it on her own from 1812 when her husband was found dead in a London carriage. Poor Elizabeth suffered further heartache losing all three of her sons when there were young, including George who died in Kingston, Jamaica in 1821. As we shall see, another widow was Rosina Rothery in the 1940s. The pub had a reputation for merriment. Customers who swore were obliged to pay a fine of ½d and a mock trial with a judge, ermine-lined gowns for solicitors, wigs and a sword were held in the mid 1800s which encouraged a great attendance to see miscreants get their come-uppance. The money was distributed to the aged people in the parish. In the 1850s we get a wonderful picture of the people who owned the pub starting with James Speck who came from Chudleigh in Devon. We might imagine that the village (and the pub?) were still violent areas with the remnants of the hordes of navvies who came to the village to build the Box Tunnel (completed in 1841) and stayed on afterwards for the quarry trade. In 1858 James and his servant, Ellen Norris, were assaulted by Job Beazer of Box but they did not press charges and the defendant had to pay costs for his liability. James owned the pub until his death on 5 February 1879 when the freehold pub was sold at auction. In the sale particulars the premises are described as: Home-brewed full licensed house with Brewery, Yard, Stables (for six horses), Coach House, Large Garden and Land. At the rear was a Lawn commanding most delightful scenery and adjoining the field occupied by the Box Cricket Club (nothing much changed there then) and the pub had a Never failing supply of spring water (particularly adapted for brewing purposes). James and Sarah had nine children and on James' death the pub and other lots were put up for auction and bought by James' youngest child, Bertha, a spinster in 1879, who three months later married Ralph Skeate Ponting and together they took over the running of the Queen's Head. The pub obviously thrived and they had stone flagons made with the logo RS Ponting Queen's Head made in gallon and quart sizes. The business was very successful but their family story was rather tragic. They had three children: Minnie, Ralph Skeate Jnr and Robert Henry. 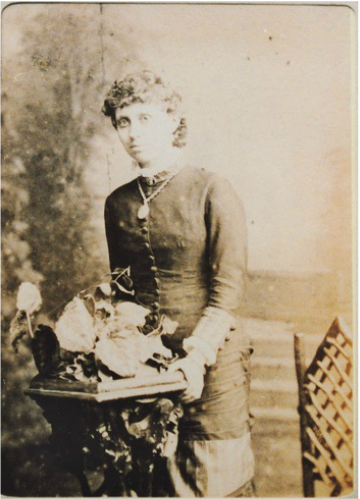 As befitted a typical middle class Victorian lady, Minnie (1880 - 1902) was a good pianist and was always practising the piano. The family anecdote is that this inconvenienced the pub's clientele and she was encouraged to use an unheated room on the top floor of the Queen's where she caught pneumonia and died aged 22. She was buried in Box with her grandparents James and Sarah Speck. You can read about the stories of the other children elsewhere on the website. Ralph Skeate Ponting Jnr served in the First World War and later became an architect. Robert Henry married Marion Daniell, the daughter of the farmers at Manor Farm next door and they owned several farms. The pub prospered and in 1891 it employed two servants and the Pontings bought St Aldhelm Villa and Lorne House in Box. When Ralph and Bertha retired, no family member wanted to run the pub so it went outside the family's ownership. It is at the beginning of the twentieth century that we see all the pubs in Box being bought out by big breweries. Interestingly the Queen’s Head was bought by George’s in 1919, a Bristol based brewery, rather than the more local Ushers. It is likely that the pub stopped brewing its own beer at this time and only served George’s beer. George’s owned the pub until 1961 when it was bought out by Courage who continued to own the premises until the pubs were bought out by the Wellington Pub Company, who still own it today. Another colourful landlord of the Queen’s Head was Frederick W Francis who in 1919 was fined for selling whisky above the maximum price. One could feel sorry for those whisky drinkers in Box as most of the local pubs were caught for the same offence in this period! Frederick had a daughter, Winnie Francis, who, by family anecdote, fell in love with Bill Daniell, a farmer at the Old Jockey. Her father threatened to disinherit her if they married so she and Bill lived together as farmer and housekeeper for the rest of their lives until the 1980s. In March 1941, a plan was devised in the event of incendiary bombs falling on the village. A number of assembly points were established and the storage of belongings was to be at the Queen's Head stables, and Mr. Milsom's garage in Burton Lane. In the 1930s and throughout the Second World War the pub was run by the Rothery family. Herbert Rothery died in 1936 after having his foot amputated. His obituary in the Bath Chronicle lists his considerable political and community works. After his death his wife, Rosina, continued to run the pub until 1957. Another example of the Queen’s Head’s long-serving landladies! You can see from the rear of the pub and the roof connections that the building has been renovated many times in its history. 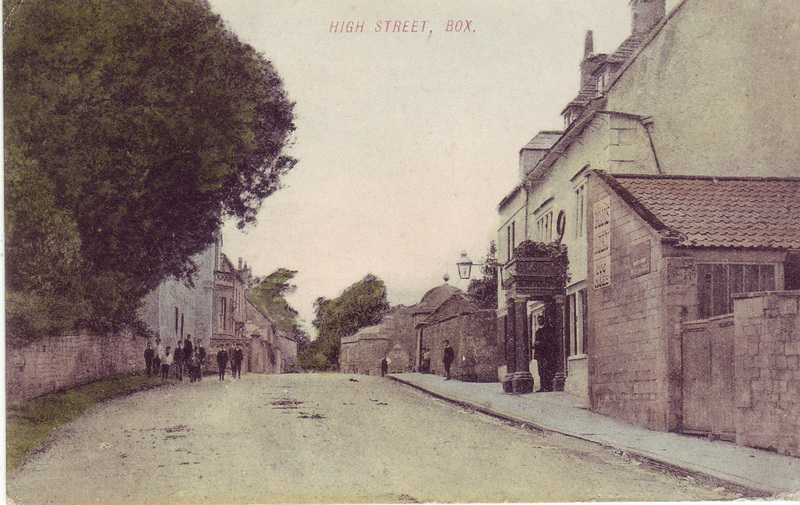 As this picture shows, part of it was used as a shop run by hairdresser, Les Bawtree. It was in 1957 that the pub layout we know today was formed. A planning application from June of that year shows the layout of the existing pub with the shop next door and its request for internal alterations and the addition of a sanitation area. The plan for this new-look pub is similar to the pub today, the notable exception being that both road entrances were still in use. Today the pub continues its reputation for music, there has been a club or music room at the rear of the pub for over a century. 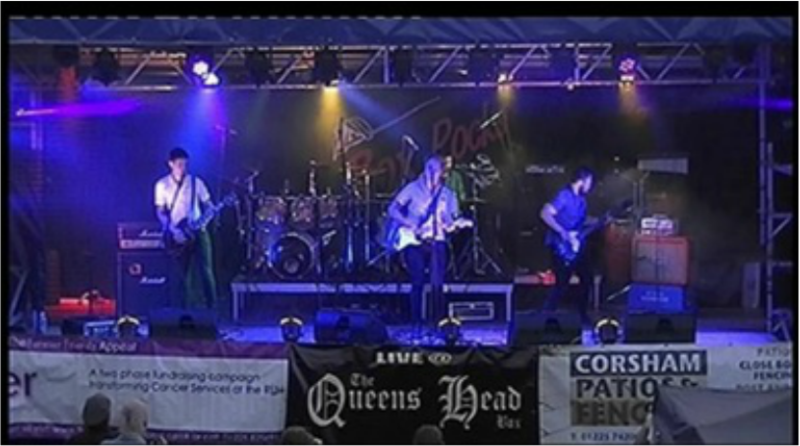 Hosting live bands most weekends and of course the annual Box Rocks, Dean and Lisa Creighton, the current landlords, are not only continuing a tradition but ensuring the pub remains open. As it becomes increasingly difficult to make an economic success of pubs, diversifying to attract new audiences is key. The enterprising licensees, the Lees, who started the pub, would be proud of this philosophy.